At Temple Pier in central London, English-accented Spanish and Catalan cheers echo down the Thames every Saturday night. The cheers in question emanate from Bar&Co, where the Penya Blaugrana London, a group of supporters group for the football — known as soccer in the United States — team F.C. 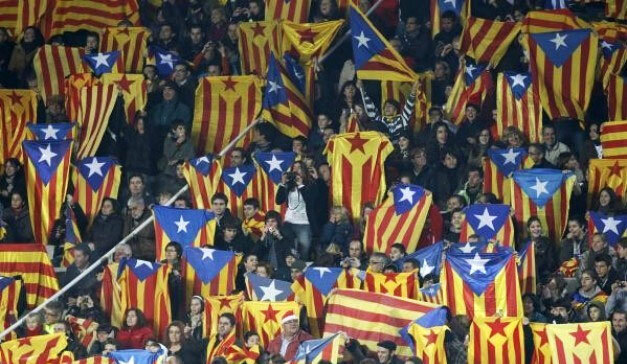 Barcelona, gathers to watch matches. Commonly known as Barça, the team hails from the capital of Catalonia and is one of the most famous soccer clubs in the world. It has inspired similar penyas, or fan groups, in cities around the globe. In London, the penya reflects the city: It is a combination of immigrants, particularly from Catalonia and British Londoners who fell in love with the team and the culture. Culturally, then, sport and society are inseparable. But a closer look at the penya’s mission statement reveals subtle ties to politics, too. They set out to promote the team’s values, to include solidarity, democracy and Catalanity (catalanisme), or Catalan national identity. That last one seems unusual to newcomers, but this is commonplace among Barça fans, whose team is historically associated with catalanisme under Francisco Franco’s dictatorship and with the continued Catalan independence movement.